Samuel and Nancy Ruggles were part of the Pioneer Company of missionaries to Hawai‘i, he was a teacher. On May 3, 1820, Ruggles and Samuel Whitney brought Humehume home to Kauai. Later, they moved to Kauai and set up a mission station there. The following is from the journal of Samuel and Nancy Ruggles. June 15th. – I must commence writing in my Jour, with an apology for past neglect though I am persuaded that my dear mother would think I had an ample excuse if but one half were told here. In addition to our own personal concerns after so long a voyage, we have been employed a considerable part of the time in making garments for the chiefs and nobility and in teaching them to read. Besides we have a little flock of children which we instruct daily. We met with a very favorable reception at this Island found the chiefs and people friendly and desirous to receive instruction. We found several American people residents here, who have been of very material service to us. Every day we receive some testimonies of their kindness. Sat. 17th. – The week past I have spent principally in visiting the different parts of Wimai; believe there is scarcely a house that I have not entered and my friendly Aloha. The more I visit and become acquainted with this people, the more I feel interested in them, and the more I desire to spend my strength and life in endeavoring to secure to them the eternal welfare of their souls. I sometimes feel almost impatient to know the language that I may explain to them the way of life and salvation. What’ little I can say they will listen to with the greatest attention, but their answer will be, “I want to know more, by and by I shall understand”. One said yesterday, “the God of America is good but the Gods of Attooi are good for nothing; we throw them all away; by and by the American God will be the God of Attooi”. The King appears more & more desirous for instruction; complains that he cannot spend time enough with his book, but says it is & time of unusual hurry at present, and he is soon to give his- mind more thoroughly to it. He with his Queen and several servants are able to read in words of four letters. Neither of them knew the alphabet when we arrived. Says the King at one time when I visited him, “Hoomehoome says you no tell lie like some white men, now you must not tell lie when you go Woahoo, but you must come back and live with me”. The week past has been a busy time with the natives. The King’s rent has been brought in from all parts of the Island and from Onehow (Niihau) a small Island about 15 miles to the westward. It consisted of hogs, dogs, mats, tappers, feathers, pearl fishhooks, calabashes and paddles. This rent is to go to Owhyhee (Hawaii) as a present to the young King. It was interesting to see the natives come, sometimes more than a hundred at a time, with their loads on their backs and lay down their offerings at the feet of their great and good Chief as they call him. When will the time, arrive that they shall come and bow down to Jehovah, and give themselves living sacrifices to Him who has purchased them -with His blood. I trust the day is at hand. — S. R.
20th. – Mr. Ruggles was called in the Providence of God about two weeks after we landed to accompany George P. Tamoree to his native Isle. When he will have an opportunity to return is very uncertain. His absence so soon after landing has rendered my situation trying, but by the friendly assistance of the brethren, I have been able to accomplish all my washing and other work. I have also done sister Holman’s, and sent her clothes to Owhyhee (Hawaii). I hope that which to me is now a trial, will be the means of great good to that poor people -who are destitute of the knowledge of God, and of his son Jesus Christ. 22nd. – We still experience the continual kindness of both white and tawny friends. The King has ordered the chiefs of this island to build three houses for our use, and enclose them in a yard of about 5 acres. He has also given us a tarro patch, and says when we have eat out all the tarro he will give us another. Hanoore lives in our family, is a dear brother to us; he has had a piece of good land given him, with three houses upon it! We cannot help enjoying ourselves when the Lord is doing so much for us. —- Nancy. King Kaumuali‘i of Kauai decided to send his son Humehume (George Prince) to America, at least, in part, to receive a formal education. 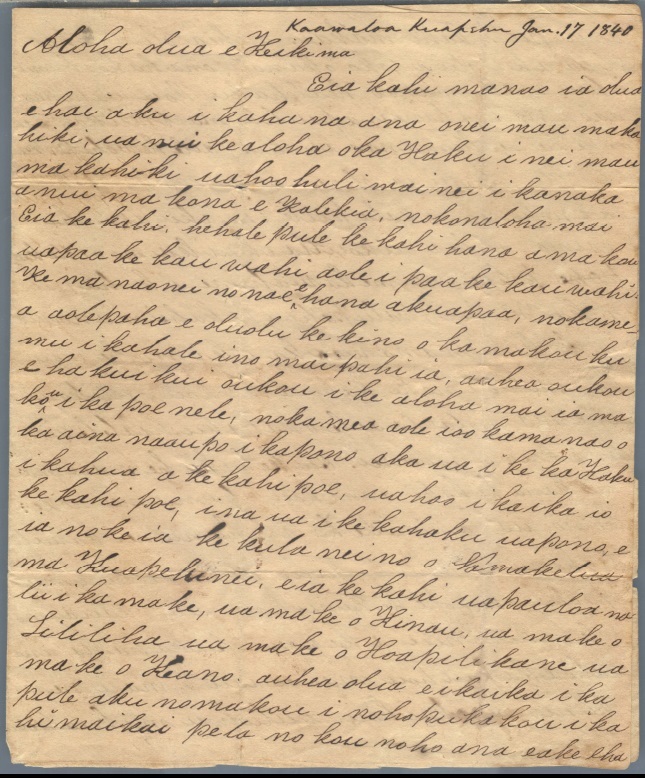 Kaumuali‘i provided Captain Rowan of the Hazard with, reportedly, about $7,000 to $8,000, an amount the king felt sufficient to cover the cost of his son’s passage and the expenses of his education. Humehume eventually enlisted in the US Navy and was wounded during the War of 1812. After the war ended, he was again thrown upon the world and without any means of obtaining a livelihood, or any one to care for him, ragged, dirty, and in want, he was again enlisted, and employed as a servant to the purser of the Navy Yard in Charlestown. With the missionaries were four Hawaiian students from the Foreign Mission School, Thomas Hopu, William Kanui, John Honoliʻi and Humehume (son of Kauaʻi’s King Kaumuali‘i.) They arrived in Kailua-Kona on April 4, 1820. Then, Ruggles and Whitney took Humehume home to Kauai. The following are extracts from the Journal of Mr and Mrs. Ruggles related to the initial days there. “We shall now retire to rest, after looking up to God with thanks, giving for mercies already received, and humbly praying that a blessing may attend our visit to these heathen. Perhaps it will be the first christian prayer that was ever offered to God on this Island. 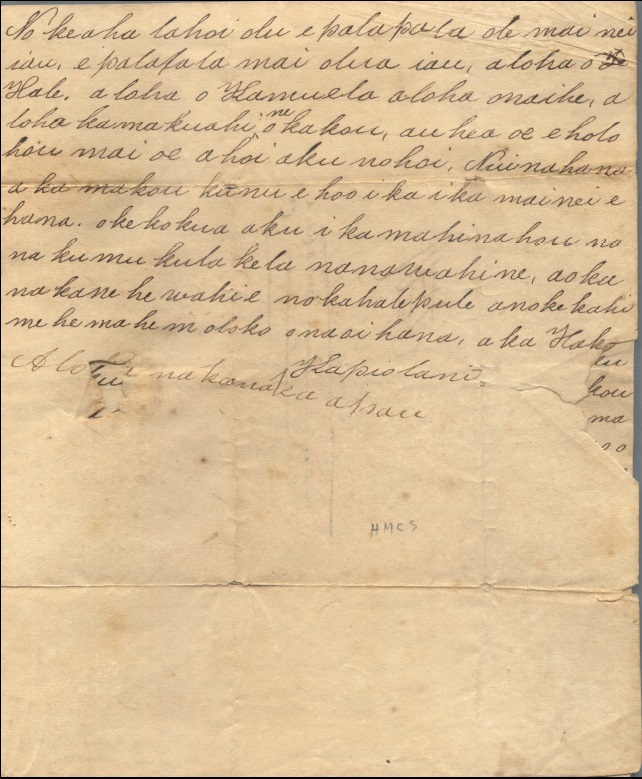 Kapule, King Kaumuali‘i’s wife, dictated a letter to Mercy Ruggles’ mother – it was written down verbatim, and copied by herself in a plain legible manner. “I send you my aloha, and tell you I am Your Friend, Charlotte Tapoolee, Queen of Atooi”. 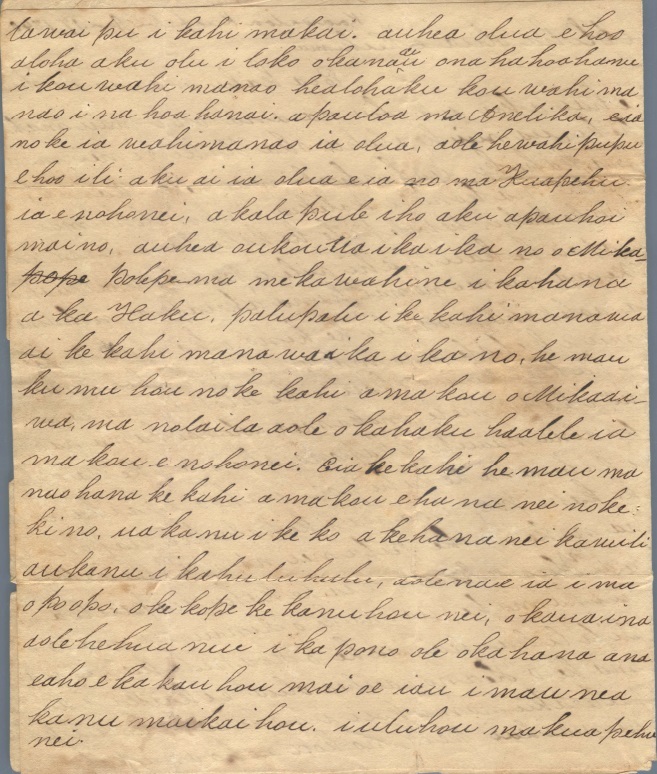 ʻŌpūkahaʻia died before he could become a missionary and return to the Islands. Samuel Ruggles, Hopu, Kanui, Humehume and Honoli‘i were in the Pioneer Company of missionaries and James Ely was in the Second Company of missionaries to the Islands. Mānoa translates as “wide or vast” and is descriptive of the wide valley that makes up the inland portion of the ahupuaʻa of Waikiki. The existence of heiau and trails leading to/from Honolulu indicate it was an important and frequently traversed land. Mānoa Valley was a favored spot of the Ali‘i, including Kamehameha I, Chief Boki (Governor of O‘ahu), Ka‘ahumanu, Ha‘alilio (an advisor to King Kamehameha III), Princess Victoria, Kana‘ina (father of King Lunalilo), Lunalilo, Ke‘elikōlani (half-sister of Kamehameha IV) and Queen Lili‘uokalani. In early times Mānoa Valley was socially divided into “Mānoa-Aliʻi” or “royal Mānoa” on the west, and “Mānoa-Kanaka” or “commoners’ (makaʻāinana) Mānoa” on the east. The Ali‘i lived on the high, cooler western (left) slopes; the commoners lived on the warmer eastern (right) slopes and on the valley floor where they farmed. Hawai‘i continues to be one of the most culturally-diverse and racially-integrated places on the globe. And remember, commercial-scale sugar production started in Mānoa. That was not the only plantation-scale agriculture started in Mānoa. In 1885, John Kidwell started a pineapple farm with locally available plants, but their fruit was of poor quality. That prompted him to search for better cultivars; he later imported 12 ‘Smooth Cayenne’ plants. An additional 1,000 plants were obtained from Jamaica in 1886, and an additional 31 cultivars, including ‘Smooth Cayenne’, were imported from various locations around the world. ‘Smooth Cayenne’ was reported to be the best of the introductions. Kidwell is credited with starting Hawai‘i’s pineapple industry; after his initial planting, others soon realized the potential of growing pineapples in Hawaii and consequently, started their own pineapple plantations. By 1930 Hawai‘i led the world in the production of canned pineapple and had the world’s largest canneries. And remember, the first commercial cultivation of pineapple and subsequent canning of pineapple started in Mānoa. Other smaller scale agriculture activities across the Islands also started in Mānoa. Wilkinson, noted for starting commercial sugar in Mānoa, also started commercial coffee in the Islands in Mānoa Valley. Coffee was planted in Mānoa Valley in the vicinity of the present UH-Mānoa campus; from a small field, trees were introduced to other areas of O‘ahu and neighbor islands. In 1828, American missionary Samuel Ruggles took cuttings of the same kind of coffee from Hilo and brought them to Kona. Henry Nicholas Greenwell grew and marketed coffee and is recognized for putting “Kona Coffee” on the world markets. By the 1930s there were more than 1,000 farms and, as late as the 1950s, there were 6,000-acres of coffee in Kona. The only place in the United States where coffee is grown commercially is in Hawaiʻi. And remember, ‘Kona Coffee’ was the same as that in Mānoa Valley. Mo‘olelo (Hawaiian stories) indicate that Pu‘u ‘Ualaka‘a was a favored locality for sweet potato cultivation and King Kamehameha I established his personal sweet potato plantation here. ‘Pu‘u translates as “hill” and ‘ualaka‘a means “rolling sweet potato”, so named for the steepness of the terrain. In 1962, MacFarms established one of the world’s largest single macadamia nut orchards with approximately 3,900-acres on the South Kona coast of the Big Island of Hawaiʻi. Today, about 570 growers farm 17,000 acres of macadamia trees, producing 40 million pounds of in-shell nuts, valued at over $30 million. Additionally, nuts are imported from South Africa and Australia, who currently lead the world market, with Hawai‘i at #3. (hawnnut) And remember, commercial cultivation of macadamia nut’s started at Mānoa. As you can see, what became significant commercial-scale agricultural ventures in the Islands – Sugar, Pineapple, Coffee and Macadamia Nuts – all had their start in the Islands, in Mānoa. Buggies on Mt. Tantalus, Honolulu, 1900s.